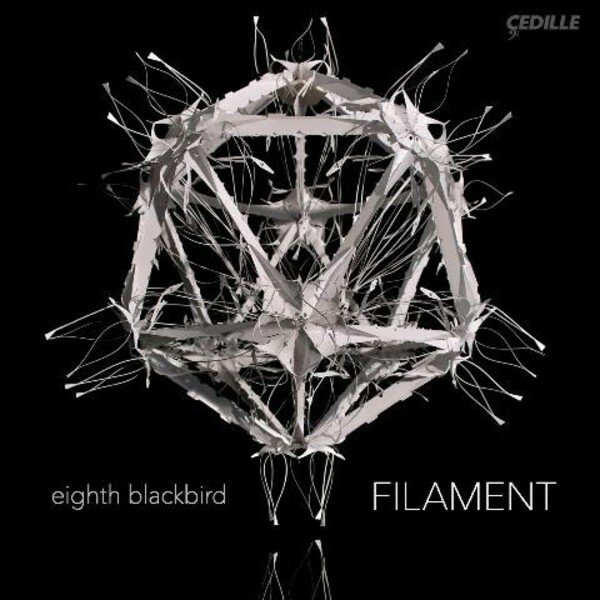 Celebrated new-music sextet Eighth Blackbird, whose last three Cedille Records albums garnered Grammy awards, continues to soar with 'Filament', a sizzling selection of four-world premiere recordings, plus a concert performance of Philip Glass�s influential Two Pages. The title 'Filament' symbolizes the strong ties of friendship and shared musical interests connecting the composers and performers on the album. 'Filament' offers first recordings of Bryce Dessner�s Murder Ballades, a fresh and surprisingly upbeat take on a macabre genre of folk music; Nico Muhly�s Doublespeak, an homage to Glass and the insistent, propulsive repetitions of classic minimalism; and short pieces by Son Lux, To Love and This is my Line, creative remixes of sounds from other tracks on the CD. Dessner, on guitar, and Muhly, on organ, join eighth blackbird for Glass�s Two Pages, recorded live-in-concert at Chicago�s Museum of Contemporary Art. A sextet of flute, clarinet, violin, cello, percussion and piano, eighth blackbird combines the finesse of a string quartet, the energy of a rock band, and the audacity of a storefront theatre company. The Chicago-based �super-musicians� (Los Angeles Times) are �a polished, personable, routinely dazzling sextet� (New York Times). In recent concert seasons, eighth blackbird has performed at Carnegie Hall (Zankel and Stern Halls), London�s Barbican Centre and Washington DC�s Library of Congress and Kennedy Center.